The Baby Trend Expedition has an economical price and continues to prove that it can compete with the more expensive strollers by earning more points than eight other products in this competition, all of which cost more. However, it just missed winning the Best Value award for Best Full-Size Stroller by the Britax B-Agile 3 and the Baby Jogger City Mini that all scored higher with competitive prices. With easy to push and turn rubber tires and convenience features not found on all of the competition, the Expedition does stand out as an attractive option for parents on a budget, that might like to go off-road or for the occasional jog. The Expedition impressed in our Best Jogging Strollers Review with a performance that helped it win a Best Value award in that review. Though not the best for serious runners, this economical stroller proves it can handle the occasional jog with ease with a very budget-friendly price. For 26 years plus the Baby Trend company has been developing products in the juvenile field. Since the beginning, the company has designed budget-friendly products for growing families. Baby Trend developed the first sit and stand stroller and the Snap-N-Go stroller. They make a variety of gear for babies from the Diaper Champ and infant car seats, to high chairs and strollers, and everything in between. The chart below shows the overall scores for the strollers we tested in this review. The Baby Trend Expedition is shown in blue. The sections below outline the details of the test results for the Baby Trend in each metric. The Baby Trend earned a 5 of 10 for ease of use. The lock on the Expedition is not designed to keep the stroller snuggly compact. This Baby Trend has a two-handed fold and with no auto-lock or carry handle, but it can self-stand. It is a three-step fold and average compared to the competition. It has a one hand pull from the seat bottom after releasing the side safety slides on the frame. The second step in the folding process of the Expedition is pulling up on the release holds on each side of the frame simultaneously. You can make the overall package smaller if you remove the front wheel, but this leaves you with two parts to carry. The heavier weight and sticky release handle make it harder to fold and the leg rest sticks out making it cumbersome. Unfolding requires 2 hands and 2 steps not including the safety straps and you need to be careful when opening it so it doesn't tip over. The double action brakes on the Expedition can occasionally skip across the gear teeth and feel like they are engaged when they aren't. The brakes on this stroller are average in their difficulty to set and release. They are double action and require both sides to be set independently. Double action brakes have a higher chance of being set improperly because both need to be engaged for the stroller to be parked. Parents might forget to do one side or chose not to if they are in a hurry. The storage basket of the Expedition has a small weight limit that makes it somewhat useless. The Baby Trend has an extra-large storage bin, but it only has a maximum capacity of 5 lbs, making it somewhat useless. This bin can be accessed from the back and sides and we managed to fit our extra-large diaper bag through the back opening, but with a 5lb weight limit, it will need to be almost empty to meet the bin limitations. The parent tray on this stroller has two cup holders and a closed storage compartment that can hold most smartphones, even larger ones. While it is nice that the Expedition has cup holders, there is a safety concern because they are located high on the stroller behind baby's head, and are shallow. This means items can fall out and onto the baby's head. During testing, we found that most water bottles did topple out and most landed on our fake baby. It also has two zippered pockets on the back of the canopy. The maximum allowed weight in the parent tray and pockets is 6 lbs, oddly more than the under seat bin. The Baby Trend also has a child's tray (above right) with cup holders and a shallow snack tray. The cups won't fit some sippy cups or standard water bottles. The tray opens to the side for easy seat access. It is also removable. The sunshade is small and has no SPF rating, but it has ventilation and a peek-a-boo window. The window is mesh and small, but so is the shade. The shade won't cover the knees of older toddlers, and there is little side protection but the canopy can rotate forward for additional sun protection. The 5 point harness on the Expedition can become a 3 point by unclipping the shoulder straps. This makes the harness less safe and we do not recommend it. This stroller has a 5-point harness that is hard to get on and off. It has height adjustable shoulder straps and an adjustable crotch strap that are not padded, but it is sort of difficult to get the parts of the buckle lined up correctly, and it is stiff to buckle and release. The recline toggle on the Expedition is easy to use, but not as nice as the push button options. The Baby Trend has a one-handed recline to lower, but it needs two hands to raise it. It has two adjustable side straps with infinite possible positions. The seat has added ventilation when reclined and it does not have an adjustable leg rest, but it is padded for comfort and the footrest is wide. The Expedition is only compatible with the Baby Trend car seat, and there are no adapters available for other brands. The Expedition earned an 8 of 10 for ease of setup. It took us close to 7 minutes to put this together, but it was our second time, so it's only fair to say it was closer to 8 the first time. The documentation for this stroller is average, but it seems to be an improvement from previous versions. The instructions and pictures are average, and it doesn't require any tools to set up. The wheels on the Baby Trend are similar to bicycle wheels and are pneumatic and made of rubber. The Baby Trend has its most impressive score in the maneuverability metric with an 8 of 10. This is an impressive score for a stroller that in all other ways is startling average. The front swivel wheel on the Expedition can be locked to limit movement for running and rougher terrain. The Expedition rolls easily and turns nicely, but not as nice as the Baby Jogger City Mini GT. It managed smaller spaces better than the Baby Jogger strollers, but it is a little tippy when you turn fast or sharply. The swivel front wheel allows it to move well and it only requires one hand. For off-road and rougher terrain, it also performs well rolling easily over grass and gravel. The Expedition is easy enough to fold, but makes an odd shaped package with a child's tray and big front wheel that get caught going into and out of the trunk. The Expedition has an average score of 6 out of 10 for weight and folded size. It weighs in at 23.7 lbs which is lighter than the average for the group, but still 6 lbs over the lightest strollers in the group at 17.5 lbs. This stroller has a folded size of 12,463 cubic inches. The Baby Trend did not score well for quality with the lowest score in the group, but it did tie with strollers significantly more expensive that the Expedition. 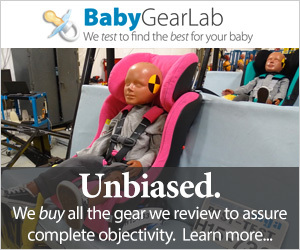 The Baby Trend earned a 4 of 10 for quality which is below the average for the group. The Expedition has a steel frame with several hinge points and plastic connectors. It is a solid frame but looks cheap. The overall fit and finish of this stroller are straightforward and adequate. Unfortunately, everything feels sort of cheap. The Expedition has a mesh peek-a-boo window that closes with two hook and loop connections. The fabric on the seat is a softer canvas with a suede-like material on the upper area of the seat where the baby's head goes. The sides of the seat are a slicker material that looks cheap but is easier to clean than the canvas in the head region. The storage bin is made of the same material as the sides of the seat with strips of mesh down the sides(like that found in the window). The wheels on the Expedition are pneumatic and rubber. It is a bicycle style wheel that has a lot of play when attached to the frame. We don't consider this a deal breaker, but it does speak to the overall quality and attention to detail on this stroller and will probably lead to vibration and wobbling over time. The handlebar is not adjustable and sits at 41 inches. Testers liked the ergonomic shape but the height might be a problem for shorter parents. The Expedition has no suspension and impacts the comfort of the passenger and ability to roll without the baby being jostled. The large air-filled tires help a little, but it is hard to compete in comfort without suspension. It also has a seat with minimal padding and a harder back that isn't as nice as the sling style seats found on most of the competition. Accessories include a rain cover sold separately. It is a clear poly-vinyl cover that attaches with hook and loop closures and can fit in the stroller pocket when not in use. Baby Trend makes several other strollers including and the side-by-side Expedition Double. While we didn't review any other Baby Trend products in this review, the Expedition single also won a Best Value award in our Best Jogging Stroller review. Amazon $77.70 - 48% off!